In the past I have found it very useful to work through a set of rules by writing a play through. 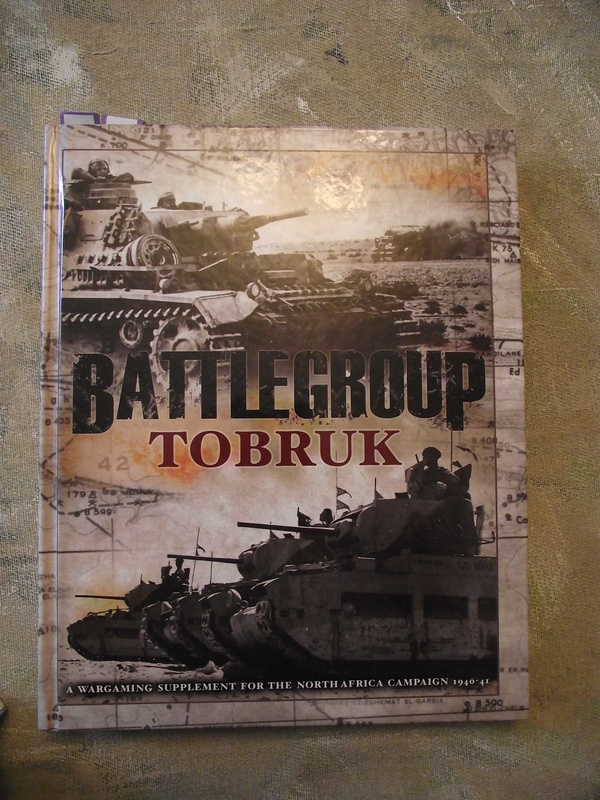 I have decided to write a play through of the Battlegroup rules with the Tobruk supplement. 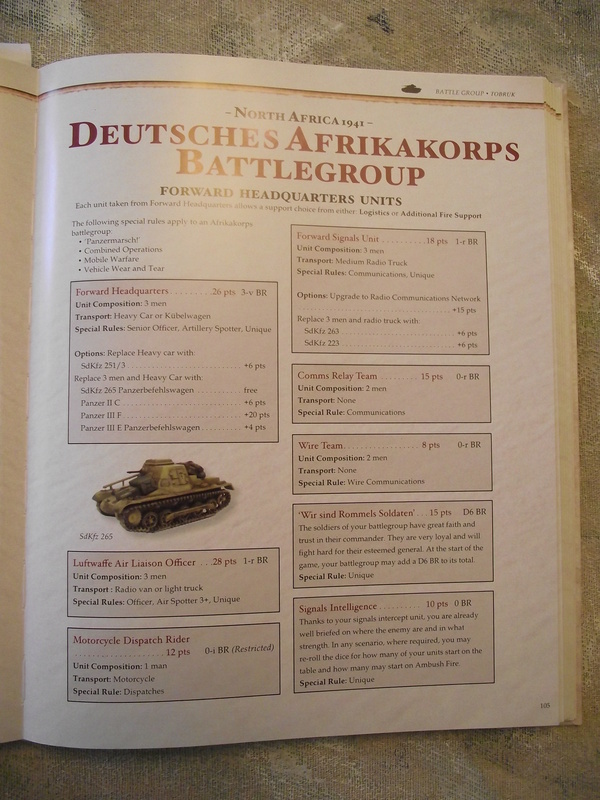 The first part will be about building a battlegroup (Dak/Italian) and the second part will be about the battle itself. Lets start. The first decision to make is the size of the battle. There are four choices – Squad (350 pts), Platoon (750 pts), Company (1500 pts) and Battalion (3000 pts). As I have played a few times I’m going to play a Platoon level game – this should give an enjoyable game, quite a few toys on the table, and with two people be done in 3-4 hours (not including set up etc). At this level I am allowed 3 restricted units with a maximum of 1 German Infantry platoon or 2 Italian platoons. I will explain restricted units later. In this game all units are 1:1. So one tank model represents one tank, one figure represents 1 man. All the lists detail how many men/crew or models. There is no unit integrity – except the need to keep all the squads of an infantry section/platoon within 1 each of each other to be able to move it under one order. It is quite clever (but by no means new) how the process for building your battle group works. There are 10 groups of units you can pick from – Forward Headquarters, Infantry, Tanks, Artillery, Defences, Reconnaissance, Engineer Support, Logistics Support, Specialist Support and Additional Fire Support. You can only take Support units by first taking Front line units (HQ, Infantry, Tanks, Artillery), as we shall see: some units are so rare that they are restricted, thus you can only take as many as you are allowed in that level – for me here its 3. Other units are also rare, but are categorised as Unique, and you can only have one in your battlegroup. The battlegroup builder (points list) looks like this. Each major force has a list, usually two; armour division and infantry division. First off Headquarters. I’m going to buy a German headquarters, this can also command Italians. I can have 25% of my points as Italian (187 points – that might be a bit tight). A basic Headquarters, in a heavy car, 3 men costs 26pts and has a 3 Battle Rating (BR). The combined Battle Rating total gives you your ability to take damage – a random amount is reduced after every unit is lost until you have no more and you break. I can upgrade the HQ to a better vehicle but I don’t feel its worth while. The HQ unit brings with it the use of Special Rules – Senior Officer and Artillery Spotter. It is also a unique unit. I will cover Special Rules in the next part, the game play through. I am also going to buy a Forwards Signal Unit, 3 men in a medium radio truck. I am going to upgrade to a 263 (hell I like them) for a total of 24pts and 1BR. Again a unique unit it gives me Communications as a Special Rule. Next I am going to buy a Luftwaffe Air Liaison Officer, 3 men in a light truck for 28pts and 1BR. This gives me Officer and Air Spotter (3+) as Special Rules and is also unique. Finally I am going to buy the ‘Wir sind Rommels Soldaten’ effect, for 15pts I am allowed to roll an extra D6 BR. As with the others this is unique. In total the German HQ has cost me 93 points and gives me 5 plus 1D6 BR points. However it isn’t over yet. By picking 4 units from the HQ list I am allowed (‘may’ not ‘must’) to buy 4 units from either (or both) Logistics or Additional Fire Support. In Logistics I am going to buy an Ambulance (14pts, 2BR, restricted, medium truck, Special Rule Medic) and a Stretcher Party (10pts, 1BR, Special Rule Medic). In Additional Fire Support I am going to buy a Timed 150mm Barrage (20pts, 0BR), this is a one off pre-registered stonk and the delivery turn/target needs to be noted before the game start. I am also going to buy a Timed JU-87 Air Strike (15pts, 0BR), as above this is a one-off attack, with a pre-registered target carrying 1 Large and 4 small bombs. So in total, without even firing a shot we have spent 152pts, with a 8 +D6 BR points. 600 points to go. Next I am going to buy Infantry. Not just any infantry, but Italian infantry, a whole platoon to be precise. Because this will be an Attack/Counterattack battle the Mobile Warfare rule comes into play – all troops have to have transport of some kind, no footsloggers in the twirly whirly desert war!! From the Ariete list I am buying a Bersaglieri Motorised Platoon (92pts, 14 BR). The platoon is made up of a Command squad (4 men in a heavy car) which gives me a Special Rule of Officer, 2 Rifle sections (8 men each in a medium truck) plus 4 light MGs (4 men with Breda 30 LMGs) mounted with the sections. With this platoon I am allowed 4 individual support units, reflecting the organic support a platoon may carry with it. Anti-Tank gun (26pts, 2 BR) 3 crew with a 47mm L32 gun and medium truck tow (again option for loader team not taken). In total my Italian Platoon has cost 179 points with 20 BR. That is about as many as I can buy. If I could buy more I would have been allowed to buy more units from Reconnaissance, Engineers Support or Specialist Support for each unit from the Infantry section bought – which would include the organic support units, so 4 in total. Perhaps this is a waste in my planning, not sure. I knew it would be tight. In total the bill so far comes to 331pts and 25 +D6 BR, leaving 419pts left. I think I may go back to Infantry, but lets look at Tanks and then see what we have left. A basic Pz IIIF platoon of 3 tanks will cost me 90pts with 9 BR. It will give me a Special Rule of Officer. Additional tanks will cost 34pts each, and to upgrade to Pz IIIG’s an additional point per tank. I think I might just go for an upgrade and keep it at three tanks, total 93pts. No, rethink, I’m going to buy a Pz IVD for the platoon, this costs 40pts and adds 3BR. Each unit from the Tanks section allows me to buy a unit from either Reconnaissance, Engineers or Specialist lists. As I bought two units (the PzIIIG platoon and the individual PzIVD) I have 2 buying choices to make. In total the Tank list has cost 189 points and gives 14BR. Overall total so far is 461 for 39+D6 BR. Now we need to make a choice – go infantry or go tanks for the remainder 230 points. Hmm, a German infantry platoon will easily cost that much (starts at 101pts plus about 70pts for the 4 organic supports if I have them all) which only leaves a 100 points of for 5 selections from Recon, Engineers or Specialist units. Hmmmm, I’d like some off table Artillery, need about 90pts. A total of 126pts and 12BR. Leaving 104 for Artillery. For my last unit I am going to buy 2 off table 105mm Howitzers for a total of 90pts and 0BR, this allows me a buy from the Additional Fire Support list. I am going to buy a 2nd Target Priority Request for 10pts. So it’s not a bad battlegroup. A weakness is there are no supply trucks, but a strength could be the artillery if that all works well!! Probably not enough scouts, but certainly enough armoured punch, and maybe too many Medics! Perhaps not enough Anti-tank guns………we shall see. 2 25pdr Guns and tows for 80pts 4BR.